If you came to know C.S. Lewis through Mere Christianity (like I did), you will be interested to know that today marks the 70th anniversary of the talk “Christian Behavior”. Continue reading below! C.S. Lewis shared many great thoughts over his years. Some of them were collected and presented in a slim volume of seventy pages published on April 19, 1943. Thus, today marks the 70th anniversary of Christian Behaviour. It is more famously known, however, as being part of Mere Christianity that came out nine years later. From whichever source you’ve read the material, they are, no doubt, among the finest discussions of traditional Christian moral teachings. 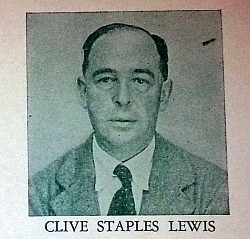 First given as a series of eight talks over the BBC (British Broadcasting Corporation) from September 20th to November 8th in 1942, they were the third set of talks Lewis had given up to that point. Yet, Christian Behaviour is actually the second book of three released before the four broadcasts were combined in Mere Christianity. Less confusing, but still interesting, is the fact that there are actually twelve chapters to Christian Behavior. Glance back up at the start of this article and you will see there were only eight talks. This is easily explained. Lewis simply found he had more to say on the topic of morals. Also explainable without difficulty (but maybe slightly less fascinating to some) is the fact that even if Lewis hadn’t added more chapters to the book, those who read the existing content would have found more material than what was given on the radio. That’s because unlike the first two sets of talks that were fifteen minutes long, this third series was only ten minutes in length. Trouble was, no one had told Lewis about this change until after he had written his scripts for the radio. Can you imagine having to cut one-third of your content down when you only had a quarter hour in the first place? Fortunately for us, Lewis added the material back for the published version. Well enough “history,” let’s consider why the content is so great. As noted, it deals with Christian morality; not exactly a topic if you are looking to write a bestseller. But that was part of why Lewis was so great, he didn’t write to make a bestseller. He wrote the best that he could on a topic he believed in and left the results in the hands of the Lord. In the opening chapter Lewis deals with “The Three Parts of Morality” and explains why rules are important; they “are directions for running the human machine” and are “there to prevent a breakdown, or a strain, or a friction, in the running of that machine.” He distinguishes the reason moral “ideas” are not the same as “rules.” Then he has you imagine “a fleet of ships sailing in formation” and makes clear the only way that voyage can be a success and how this example relates to morality. The topic of the second chapter is plain from the title: “The ‘Cardinal Virtues’.” Here Lewis elaborates on prudence, temperance, justice and fortitude. When he was discussing them back in the 1940′s he was aware that his audience (much like today) misunderstand the meanings of those words, so he was careful to define and explain them. The third chapter, “Social Morality” explains that Christians don’t have a “detailed political programme for applying” something like the Golden Rule. Nor do we find “lessons in cookery” in the Bible that commands us to “feed the hungry.” In the next chapter Lewis compares “Morality and Psychoanalysis” and underscores the fact that psychoanalysis does not help make individuals choose wisely. 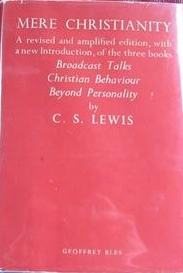 The fourth and fifth chapters proves that Lewis had decided to not follow the popular advice of “how to win friends and influence enemies” because they were about “Sexual Morality” and “Christian Marriage.” He turns a corner, however, and gives a more digestible chapter next on “Forgiveness.” Among his points is the truth that you are not excusing others when you forgive them. He also gives helpful advice by suggesting you tackle forgiveness like math: don’t attempt calculus until you have mastered addition. In “The Great Sin,” Lewis notes that the center of Christian morals does not lie with sexual morality, but with pride. He warns: “Pride leads to every other vice.” He then ends with chapters on the “Theological” virtues: Faith, Hope and Love, but not in that order. He had so much to say about “Faith” that this is actually the title of the final two chapters! There is, of course, much more that I could say about the content of this great book. However, instead of doing that, how about you leave a comment below and tell me what you enjoyed the most about this landmark publication. My first intro to Lewis was Screwtape Letters given me by a lovely young Christian woman while I was still an atheist. I put in the lovely part because that’s probably why I agreed to read it. Who was I to argue? I became a Christian while still reading it. Mere Christianity soon followed though, and did much to strengthen my faith. Thanks for letting me join the anniversary celebration here, Crystal! Thanks for joining the party Tim! This year is full of anniversaries for Lewis, including the 5oth anniversary of his death. This post was reposted with permission of my good friend William O’Flaherty of Essentialcslewis.com. We are currently recording a podcast on The Chronicles of Narnia (a show for every book). Thanks for stopping by! You are welcome here anytime.